Every year, the Social Security Administration(SSA) publishes a chart that demonstrates the percentage of cases that have been awarded and denied benefits at the different levels of the Social Security Disability process. This chart is known as the Social Security Disability Waterfall Chart and it can help to provide some insight into what individuals who are applying for SSDI and SSI can anticipate from a statistical perspective. The initial application stage is depicted by the purple boxes in the chart above. In 2017, 67% of applicants for SSDI and SSI were denied, and 34% of applicants were awarded benefits. Do not give up if you cannot work and your claim is denied. Most claims are denied at the Application Level. Some things to consider in your initial application process. After an applicant completes his application, he must complete a work history report and a disability report. These reports request information about his medical history, education, and work history so the SSA can better assess his case. The last step of the application process is often a Consultative Exam. Once the application the two reports and the consultative exam are completed the SSA will make their decision on your claim. 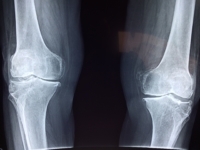 If a claim has been denied at the Application Level, the next step is to request Reconsideration. At the Reconsideration Level, as depicted in the green boxes in the waterfall chart above, 13% of cases are allowed, and a staggering 87% are denied. The chances of being denied at the Reconsideration level are significantly higher than at the Application Level. At the Reconsideration Level the SSA will re-review your application, but this time a different disability examiner will decide if your claim should be approved or denied. The first step to Reconsideration is submitting a Request for Reconsideration (Form SSA-561-U2). Then you will need to complete and submit a disability report detailing any new medical information. Once those two documents are submitted, the SSA will decide again whether your claim should be approved or denied. If your application is denied you will need to request a hearing before an ALJ. At the Administrative Law Judge Hearing Level claimants have the best chance of being awarded benefits. The Administrative Law Judge Hearing Level is shown in the orange boxes in the waterfall chart above. 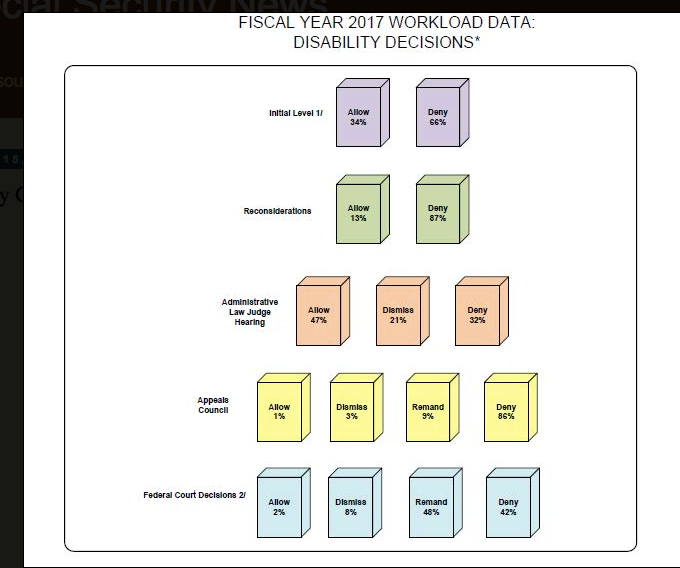 According to the waterfall chart, 47% of claimants were awarded benefits at the Administrative Law Judge Hearing Level, 32% were denied, and 21% were dismissed. Again, the majority are still denied and dismissed at the Administrative Law Judge Hearing Level, but this is still the level with the highest statistical chance of approval. The fourth step known as the Appeals Council (“AC”) and is illustrated in the yellow boxes in the above waterfall chart. The AC has the most abysmal statistical approval rating for claimants. If your case is denied at the first three levels, your attorney will submit a written argument to the AC in Falls Church, Virginia. Claimants do not have to appear at the AC in person. According to the waterfall chart, the AC awarded 1% of claimant’s benefits in 2017. The AC dismissed 3% of cases, and most importantly, the AC remanded 9% of cases. Remanding a case means that the AC will not approve or deny the case, but instead send the case back to the ALJ to rehear the case. The AC denies a higher percentage of cases than any of the other level in the Social Security adjudication process, in 2017 the AC denied 89% of requests. The final step is the Federal Court Level, depicted in the light blue boxes in the waterfall chart. This level includes cases at the Federal District Court, the Circuit Court of Appeals and the United States Supreme Court. The Federal Appeals process is used by very few disability applicants. However, it has the highest rate of approval out of all of the levels discussed. At the Federal Court Level, 2% of claims were awarded benefits, 8% of claims were dismissed and 42% of claims were denied. Most notably, at the Federal Court level, 48% of claims were remanded to the ALJ for rehearing. Are you or a loved one considering hiring an SSD attorney for your case? Get a complimentary case evaluation by calling #800-419-7606 or completing our online evaluation form today.